As Space Shuttle Endeavour continues to enjoy a smooth processing flow at pad 39A, Space Shuttle Program (SSP) managers have completed a series of Flight Readiness Reviews (FRRs) ahead of the STS-126 launch in two weeks time. Among the various departments presenting their reviews of Endeavour’s systems during the SSP FRR last week was the Systems Engineering and Integration (SE&I) board – bringing forth a wide range of presentations from Return To Launch Site (RTLS) abort safety upgrades to the introduction of a new Launch on Need (LON) mission configuration. The first item presented to the SSP FRR by the SE&I related to the Space Shuttle Main Engines (SSMEs) – specifically, a trending decrease in the Over Board Mixture Ratio (OBMR). “STS-123 Post Flight Reconstruction showed lowest OBMR since RTF (Return to Flight). All available Fuel Bias was consumed (around 1200 lbs),” notes the Shuttle Program FRR document available for download on L2. Despite this critical situation, the presentation notes that Endeavour/STS-123 was not in any danger of a Low Level Cutoff – via the Engine CutOff (ECO) sensors – because the mission had a positive Ascent Performance Margin. A Technical Interchange Meeting (TIM) – which took place in July 2008 – not only confirmed the low OBMR readings, but also put forth a plan to mitigate this critical situation on future flights. Since STS-126 will fly before this mitigation plan can be implemented fleet-wide, the SSP has designed a work-around option relating to the SSME (Space Shuttle Main Engine) Control Mixture Ratio (CMR). As such, Endeavour will be the first vehicle to fly with a new SSME CMR of 6.049 mru. With over 10,000 seconds of testing at this higher CMR already documented, the numerical data has given engineers and SSP managers confidence that the new CMR will mitigate the OBMR issue – which, since RTF, has been the most severe on Endeavour’s flights. The second major topic of discussion in the SE&I presentation related to the new OI-33 software debuting on STS-126, as first noted in the MOD FRR presentations. With this software upgrade, several noteworthy safety improvements to the RTLS flight profile will be achieved, the most significant being a 60 percent reduction in a Loss of Crew scenario. “A RTLS abort has the most risk of any intact abort, with the External Tank (ET) Separation phase being the biggest threat,” notes the associated SSP FRR presentation. Implementation of the OI-33 software provides several RTLS specific safety modifications including: Improved Reaction Control System jet selection logic, Rudder Speed Brake operations, improved steering commands during powered and mated coast phases of flight, and “trajectory design changes in the Alpha profile during the Powered Pitch Down phase (last 20 seconds of powered flight) to improve the initial separation condition” between the Orbiter and the ET. In addition to these enhancements, the OI-33 software will increase the overall success rate for a RTLS abort without a GPC failure to 99.67 percent from 96 percent. The software will also increase the overall success rate for a RTLS abort with a GPC failure to 97 percent from 84 percent..
Another enhancement offered by the OI-33 software is Enhanced Crew Situational Awareness during ascent and entry. The SE&I presentation notes that “two new graphical displays that enhance on-board situational awareness and no-comm abort selection capabilities” have been added to the bearing displays. Also, the new software will “integrate data to provide on-board information on current vehicle location and performance” to the Commander and Pilot. Another issue – or rather an update to an ongoing issue – is the debris assessment calculations for STS-126. “Three debris risks remain at the 3/5 level for STS-126,” notes the FRR presentation. “ET redesigns and process-oriented debris mitigations since RTF have significantly reduced the risk to the vehicle” and crew. With improved debris risk categorization techniques and continued improvements to the ET, a significant reduction in the “Infrequent/Catastrophic” risk category has been observed since shuttle launches resumed in 2005. Nevertheless, debris is still a risk for Endeavour, with Lift-off Debris, Umbilical Ice, and Orbiter Putty Repair listed as the three remaining “Infrequent/Catastrophic” debris risks for the mission. Furthermore, as with all missions, a complete review of the imagery hardware was reviewed to ensure that all necessary photographs can be obtained during Endeavour’s ascent. The presentation notes that the ET camera and flash system in one of Endeavour’s umbilical wells is ready to support the mission, whether it launches in darkness or daylight; also, four new thermal imaging cameras and six visual-range cameras around Pad A are ready to support flame trench monitoring efforts when Endeavour launches. For the visual-range cameras, “two high powered flood lights placed near each camera site (will) help illuminate the exit of the SRB flame trench,” notes the FRR presentation. Also, two new HD cameras have been mounted on the Fixed Service Structure. Information late this week also confirmed the installation of special sensors into the flame trench, which will monitor the condition of the repaired fondu frye concrete – following the serious damage suffered during STS-124’s launch. During that launch, thousands of bricks were blown out of the flame trench, with infrared video showing multiple objects rising as high as the top of the Fixed Service Structure (FSS). While shuttle manager John Shannon recently noted that the objects weren’t bricks – some were found on the MLP (Mobile Launch Platform) Zero Level. The debris include throat plugs from the SRBs and debris created by the SRB water baggies that are destroyed at T-0. However, video evidence proved to be mainly inconclusive, due to the white out suffered by the brightness of the SRBs during the opening seconds of ascent. The new imaging cameras will be better able to cope with this issue, providing additional video data in the event of a debris incident. 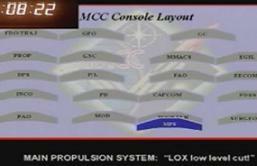 Also debuting with STS-126 is a change to the Launch on Need (LON) orbiter configuration. “In the event of call-up, the STS-119 Base Mass Memory would be flown on OV-103 using STS-119 Base Load and associated products and flight specific I-load patches,” notes the presentation. As such, should a LON situation develop during STS-126 (which is highly unlikely), NASA would use the “fly the next flight” approach. Essentially, Discovery would fly the full-up STS-119 mission profile, complete with the S6 Truss, to rescue the Endeavour crew. Moreover, Discovery’s rescue mission would still conduct the Boundary Layer Transition Detailed Test Objective, a test that Discovery is currently undergoing modifications for in OPF-3. As always, dissenting opinions within the SE&I were sought, but none were identified.